After you get through Rays Hill Tunnel you can bike 4 miles to the Western Portal of Sideling Hill Tunnel. This is scenic country in the middle of Buchanan State Forest. As I recall, there is a mild grade approaching (see picture) Sideling Hill Tunnel from the west, probably on the order of 1% or so. I would guess it's probably less than a quarter mile long. The rest has very mild grades. Not flat, but pretty close. The west-bound lanes were in fairly good condition, the east bound lanes were pretty rough, but still rideable. Be careful of the median, there are old drains about 3 ft. square that no longer have grates on them & they aren't always obvious. All the median guardrails have been removed, so the pike looks more like it did originally, except the median is paved instead of grass. You still need to be aware of unexpected traffic. While we were there, a jeep came up behind us heading west & went through Rays Hill. He must have been doing 60 or so. The tunnel is pretty dark, so from my experience, I'd be wary of riding through the tunnel, at least Rays Hill because for people living in the valley, going through the tunnel is a much more convenient way to get to Breezewood. We had a blast What a great family experience. We drove each time and had no problems, but maybe we were just lucky. If you drive, be careful in the tunnels especially Sidling Hill as they have doors and they could be locked, (Although I have never encountered locks). The first time, we entered in the back of the Ramada Inn parking lot in Breezewood. The next two time through the open gate after the Turnpike Toll booths at Breezewood. I have also entered the pike at the area in the eastbound lane just down the hill from the Sidling Hill Rest area. ( It looks like a highway maintenance yard) . Again, great to hear from you! Q- is the Sideling Hill Tunnel passable? I travel the pike weekly from Bedford to irwin. Q - Are you saying that you can actually drive a car on the abandoned sections???? A. Laurel hill i would drive . . . no real danger . . .but Sideling and Rays I biked and walked.. . . Thanks for your instructions about finding the roadbed near Breezewood. We made it to Breezewood Saturday despite a dismal forecast. The day was fantastic! Clear and bright. We walked through Ray's Hill Tunnel, going west to east. During the first trip through we used a flashlight because I was unsure about the road surface. Coming back through, we dispensed with it and just walked through the darkness. I did not have the time to do everything I wanted to do. Also, though my friend was enthusiastic, he doesn't quite have my level of turnpike-itis. I did not make it to the entrance of Sideling (which is what I'd hoped to do). I checked out the ventilator building/housing, and I'll never forget the impression of the masses of brightly-colored leaves seen through the front "vented" opening of the fan housing. Incredible! I did not enter the building---the windows looked easy to get into but not as easy to climb back out of!!! Another time . . . I'd definitely like to go back and see Sideling. The still beauty of the clear day and the colored leaves of the trees, the profound quiet of the tunnel (a single leaf blowing through made a loud clatter! ), and the empty roadbed made a deep impression on me. Thanks for your interesting Web site and information! --Bill Fogle. Joe, I made the trip! It was the greatest! I found the old Breezewood ramps, still in great shape, drove right up to the eastern portal of Laurel Hill in the middle of the night and to the western portal of Rays Hill at about 8AM. Took great photos. Not that this knowledge will do me any good, but it was fascinating to finally see remnants of the original turnpike. 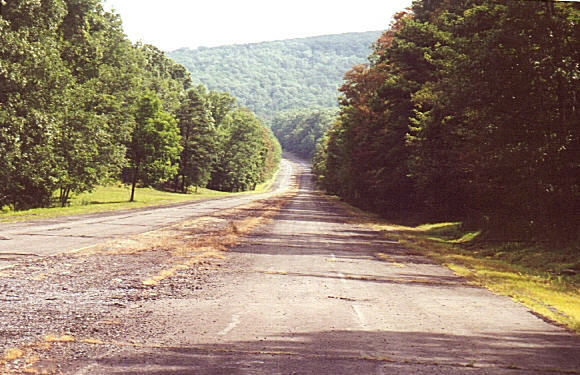 I also understand now what they did at Breezewood and it is fascinating how they left the old road intact into town as the exit/entrance ramp to the turnpike at the intersection of the western end of the bypass. I didn't do Sideling Hill but might do that next time. It was neat to compare the road to the old photos..... It is something else to experience the old tunnels and road. I feel i am in a twilight zone film at that point and there is a nuclear disaster and you are the only one left around. They did make parts of a movie on the old road but i do not know the mane of it. Last week another turnpike fan who lives in D.C. visited the tunnels and road, they were a group of 8 people. They walked miles to see both tunnel site, old C.C.C. camps, and old 1883 Vanderbilt sites in between the tunnels.